You would think from watching “Downton Abbey” that the only reason enormous estates existed was to provide jobs. Every time a change comes up, the lord of the manor bemoans its possible deleterious effect on his tenants and servants. And a remarkably high proportion of those servants seem happy to live their entire lives in the basement and the attic, never getting married, never having kids. Life as a servant is just such a meaningful identity, it seems. Oddly, no mention is made of actual history, of the mansions in which servants had to turn their faces to the wall whenever a master or mistress passed them. In many cases, servants were essentially human machines and human furniture whose lives and even names were almost unknown to their employers. Similar whitewashing is going on with the ultra-rich of today. We have heard a certain proclamation so often that we’re in danger of believing it: “enormous wealth makes people ‘create jobs.’” It’s almost as if starting a business, like owning vast holdings and a noble title, were essentially a charitable enterprise. And along with the first assumption, comes another: that those jobs created will be American jobs. Recently, a Silicon Valley start-up begun by several Americans and Indian nationals (or possibly dual citizens) interviewed a friend of mine. They let him know that their business was so India-centric that every engineer was expected to be available for a 10:00 pm meeting nightly to correspond with the team in India. If there’s another economic downturn and profits aren’t as high as expected, they are poised to jump ship and do all their work in India. Sure, the headquarters might be here, but except for a few plum positions, the labor will be there. Let’s face it: people start companies in order to make money, not to give money away or to help the poor (with the rare exception of a Voltaire), and if they can make more money in China, they will. “Why not?” asked Bill Moyers. The ultra-rich will always need gardeners, nannies, masseurs, housekeepers, chauffeurs, tax advisers, and yacht-repairers, and in some cases prostitutes and drug dealers, but beyond that, they are no more likely to create jobs than anyone else. It’s also true that billionaires invest in businesses—they have to put their wealth somewhere—but the businesses they invest in may be cutting the local labor force and exploiting the one abroad in order to offer the huge profits people have decided they can no longer live without. Fred Smith is now heavily invested in China with major Fed Ex operations there; he mentioned South and Central America as areas of future expansion. Nothing at all requires the super-rich to create jobs here. Why? Because of the bottom line, profit. It’s the people who are not extremely wealthy, who have good ideas and just enough capital, that start businesses, for example, the full-time factory worker who invests in a food cart. Without government playing a part to level the playing field, entreprenuers who pay well suffer a disadvantage, while the unprincipled race to the bottom. A job I once had put me in contact with a wealthy woman who could donate $70 million and not feel it. Her money made her dependent before her time (she never drove at all, but needed a chauffeur; she also needed someone to dress her though countless eighty-year-olds dress themselves). Worst of all, her money kept her living in a 1950’s mindset. She said to me in all seriousness, “It’s so hard to get good help,” and went on to complain that her maid who was black, “but light black,” had made the crazy decision to get married and move out. 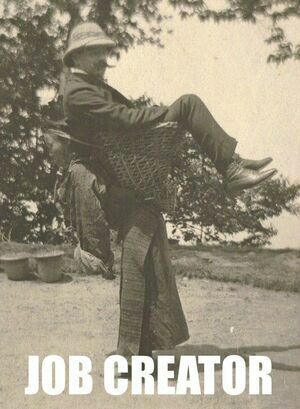 To this woman, lifelong servitude was perfectly acceptable. Maids existed to make her life easier, and unlike Lord Grantham, she’d have been extremely unlikely to arrange for her servants’ medical needs. Having been surrounded by sycophants and others who wanted her money, she was able to maintain openly racist attitudes while the culture around her grew and changed. Was she a job creator? Hardly. Her life was a routine of eating the same meal at her club every evening, watching sports on the best of TVs, activities she could easily have done with one-hundredth of her wealth. Her wealth left not only her financial, but her moral and physical capacities unused. Her wealth harmed her.